The Cascadas de Agua Azul (Spanish for “Blue Water Waterfall”) are found near the Municipality of Tumbalá, in the middle of the Chiapas rainforest, Mexico. It consists of many cataracts following one after another in the Cascadas de Agua Azul Natural Park. The larger cataracts may be about 6 meters (20 ft.) high. The stunning blue colour that distinguishes these waterfalls is due to the limestone through which the waters pass. 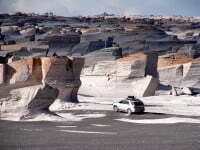 It is composed of various types of sediments but mainly calcium carbonate and magnesium hydroxide, both white or beige. When light travels through water, it absorbs the entire color spectrum except blue, which reaches the bottom and is reflected back to the surface, resulting in beautiful shades of turquoise. Another interesting feature of the Cataratas de Agua Azul is that fallen trees and rocks that lean against the waterfall have a thick shell-like coating of limestone due to the water sediments. During the dry season (from December to July) the sun constantly allows to see their characteristic colour, although the rainy season increases its spectacular flow.